The ministers meet in camera a day before a meeting of the Economic and Financial Affairs Council (ECOFIN) of the Council of the European Union. They communicate their decisions via press and document releases. The group is related to the Council of the European Union (only Eurogroup member states vote on issues relating to the euro in the ECOFIN) and was formalised under the Treaty of Lisbon. The Eurogroup, formerly known as the Euro-X and Euro-XI in relation to the number of states adopting the euro, was established at the request of France as a policy co-ordination and consultation forum on eurozone matters. The December 1997 European Council endorsed its creation and the first meeting was held on 4 June 1998 at Senningen Castle in Luxembourg . To begin with, the chair of the Eurogroup mirrored that of the rotating presidency of the Council of the European Union, except where the Council presidency was held by a non-eurozone country, in which case the chair was held by the next eurozone country that would hold the Council presidency. In 2004 the ministers decided to elect a president and in 2008, the group held a summit of heads of state and government, rather than Ministers of Finance, for the first time. This became known as the Euro summit and has held meetings irregularly during the financial crisis. Since the beginning of the monetary union, its role has grown in regards to the euro's economic governance. The fact the group meets just before the Ecofin council means it can pre-approve all Ecofin's decisions on eurozone affairs. In 2009 the Treaty of Lisbon formalised the group and its president. The current President of the Eurogroup, dubbed "Mr Euro", is Mário Centeno, the Minister of Finance of Portugal. In September 2004, the Eurogroup decided it should have a semi-permanent president who would be appointed for a term of two years. Finance Minister and then Prime Minister of Luxembourg Jean-Claude Juncker was appointed to be the first President of the Eurogroup, mandated from 1 January 2005 until 31 December 2006, and was re-appointed for a second term in September 2006. Under the Lisbon Treaty, this system was formalised and Juncker was confirmed for another term. The presidency has helped strengthen the group, since before Juncker's appointment the Eurogroup was only present at meetings in the European Parliament. Since the position of President of the Eurogroup was created, the president has attended the European Parliament Committee on Economic and Monetary Affairs every six months. After his reappointment as President of the Eurogroup in January 2010, Juncker emphasised the need to broaden the scope of the Eurogroup's business. In particular in terms of co-ordinating economic policies and representation. Juncker proposed creating a small secretariat consisting of four to five civil servants to prepare the group's meetings. However, although France and Spain support such plans, Germany fears that strengthening the group might undermine the independence of the European Central Bank. In June 2012, the Estonian Minister of Finance Jürgen Ligi was being considered as a possible successor for Juncker. In January 2013, Juncker however hinted that his likely successor would be Jeroen Dijsselbloem of the Netherlands, who was appointed second President of the Eurogroup on 21 January 2013. On 13 July 2015, Dijsselbloem was reelected. On 4 December 2017, Mário Centeno of Portugal was elected to be the third President of the Eurogroup and took office on 12 January 2018. The ECB President, Economic and Monetary Affairs Commissioner and Chairman of the Eurogroup Working Group also attend the meetings. Members of the EU who choose not to participate in the Eurozone have been excluded from observer status. The membership is however fluid; IMF personnel such as Christine Lagarde are sometimes allowed to be present at meetings. What remains unknown about this group is whether they allow observers to speak or speech by the observers is forbidden. Furthermore, the treaty amended the Council of the EU's rules so that when the full Ecofin council votes on matters only affecting the eurozone, only those states using the euro (the Eurogroup countries) are permitted to vote on it. This vastly informal nature has led to a number of controversies, criticisms and debates on the governance of the monetary union. Because of its minimalist legal basis, the Eurogroup is mostly an informal body with very large discretionary powers. Though such nature may have allowed decisiveness in decision making during the euro crisis, this also led the Eurogroup to suffer from the lack of accountability and limited democratic oversight. Hence a growing number of critics by various stakeholders against the undemocratic aspects of the Eurogroup. In 2017, the Commissioner Pierre Moscovici described the Eurogroup as "a pale imitation of a democratic body." and former Greek finance minister Yanis Varoufakis vocally denounced its "outrageous opacity". The non-transparency of the Eurogroup was a significant factor in the formation of the DiEM25 movement to "re-democratize Europe", to which Varoufakis belongs. NGO Transparency International has also repeatedly called for an overhaul of the governance of the Eurogroup. The European Ombudsman has even opened a case on the matter, demanding more transparency. In 2008, in light of the 2008 financial crisis, French President Nicolas Sarkozy (speaking at the European Parliament as the outgoing President of the European Council) called the Eurogroup to be replaced by a "clearly identified economic government" for the eurozone, stating it was not possible for the eurozone to go on without it. The eurozone economic government would discuss issues with the European Central Bank, which would remain independent. This government would come in the form of a regular meeting of the eurozone heads of state and government (similar to the European Council) rather than simply the finance ministers which happens with the current Eurogroup. Sarkozy stated that "only heads of state and government have the necessary democratic legitimacy" for the role. This idea was based on the meeting of eurozone leaders in 2008 who met to agree a co-ordinated eurozone response to the banking crisis. This is in contrast to an early proposal from former Belgian Prime Minister Guy Verhofstadt who saw the European Commission taking a leading role in a new economic government, something that would be opposed by the less integrationist states. Sarkozy's proposal was opposed by Eurogroup chair Jean-Claude Juncker who did not think Europe was ripe for such a large step at the time and opposition from Germany killed off the proposal. Merkel approved of the idea of an economic government, but for the whole of the EU, not just the eurozone as doing so could split the EU and relegate non-eurozone states to second class members. In his 2011 State of the Union address, Commission President José Manuel Barroso opposed the Franco-German intergovernmental plan, stating that community institutions should perform that role. In 2017, a number of voices including Pierre Moscovici, Emmanuel Macron and Jean-Claude Juncker have called for the Eurogroup to formally chaired by the European Commissioner for Economic and Monetary Affairs and the Euro. This would constitute a step towards formalizing the Eurogroup as a branch of the European executive. 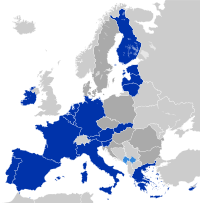 On 15 April 2008 in Brussels, Juncker suggested that the eurozone should be represented at the International Monetary Fund as a bloc, rather than each member state separately: "It is absurd for those 15 countries not to agree to have a single representation at the IMF. It makes us look absolutely ridiculous. We are regarded as buffoons on the international scene." However Finance Commissioner Joaquin Almunia stated that before there is common representation, a common political agenda should be agreed. In January 2010 Juncker indicated that the Commission is to propose that the group become a member of the G20. During the 2013 Economic crisis in Cyprus, Eurogroup proceeded towards the first bail-in approach towards the Cypriot banking sector, resulting in the confiscation of deposits of Cyprus' two main banks. Despite the lack of any visibility on the banks' credentials and balance sheets, Eurogroup decided to utilise deposits of the two banks for a bail-in. The process is not completed yet. [needs update] However, it has been criticized by some in the EU as an attack on private property. In March 2017, Jeroen Dijsselbloem, the President of the Eurogroup at the time, told the German newspaper Frankfurter Allgemeine Zeitung "As a Social Democrat, I attribute exceptional importance to solidarity. But those who call for it also have duties. I cannot spend all my money on drinks and women and then hold my hand up for help. That principle applies on a personal, local, national and also on a European level." while referring to Southern European countries affected by the European Debt Crisis. This statement led to strong reactions by many European figures, as Gianni Pitella, head of the Socialist group in the European Parliament (to which Dijsselbloem's party belongs) said "There is no excuse or reason for using such language, especially from someone who is supposed to be a progressive". Manfred Weber, leader of the European People's Party group, tweetted "Eurozone is about responsibility, solidarity but also respect. No room for stereotypes". The Portuguese Prime Minister, António Costa, said his words were "racist, xenophobic and sexist" and that "Europe will only be credible as a common project on the day when Mr. Dijsselbloem stops being Head of the Eurogroup and apologises clearly to all the countries and peoples that were profoundly offended by his remarks". Former Italian Prime Minister Matteo Renzi also called on Dijsselbloem to quit, saying that "If he wants to offend Italy, he should do it in a sports bar back home, not in his institutional role". In a reaction Dijsselbloem said: "Everyone knows that I didn’t say that all southern Europeans spend their money on drinks and women. That’s not what was in the interview and it wasn’t my message. The anger about the interview is anger about eight years of policies to deal with the crisis. [...] I would have rephrased it otherwise probably. But it was my way of making clear that solidarity is not charity. It's not for nothing that the aid programs of the European emergency fund are accompanied by strict conditions: You get very cheap loans provided you take action to restore order. That is an important principle. For the ones who keep zooming in on those two words my message might be inconvenient. [...] It won't end well with the eurozone if we keep breaking our previous agreements. [...] My choice of words was not right, I'm sorry if you took offense, but I'm still behind the message." ^ a b "Mário Centeno elected new Eurogroup President | EU Council Newsroom". tvnewsroom.consilium.europa.eu. Retrieved 4 December 2017. ^ "Juncker re-elected Eurogroup president, voicing optimism over economic growth". People's Daily. 9 September 2006. Retrieved 2 January 2008. ^ Willis, Andrew (3 December 2009) Luxembourg leader set to extend euro zone reign, EU Observer. ^ "The next Juncker should be an Estonian". Der Spiegel (in German). 20 June 2012. ^ "Juncker hints Dijsselbloem will replace him as Eurogroup chief". Europolitics. 10 January 2013. Archived from the original on 14 May 2013. ^ "Dijsselbloem voorzitter eurogroep" (in Dutch). NOS. 21 January 2013. Retrieved 21 January 2013. ^ Lenoir, Francois (13 July 2015). "Dijsselbloem re-elected head of Eurogroup ministers: statement". Brussels, Belgium: Reuters website. Retrieved 13 July 2015. ^ "Eurogroup confronts own deficit: governance". POLITICO. 24 May 2017. Retrieved 3 November 2017. ^ "My speech at the Ambrossetti Forum : the future of the euro | Le blog de Pierre Moscovici". www.pierremoscovici.fr (in French). Retrieved 3 November 2017. ^ a b "The Eurogroup Made Simple". Yanis Varoufakis. 30 March 2016. Retrieved 3 November 2017. ^ EU, Transparency International. "Transparency International EU - The global coalition against corruption in Brussels". transparency.eu. Retrieved 3 November 2017. ^ Ombudsman, European. "Transparency of the Eurogroup". www.ombudsman.europa.eu. Retrieved 3 November 2017. ^ Honor Mahony (6 May 2015). "The rise of the untransparent 'Eurogroup'". EU Observer. Retrieved 19 October 2015. ^ "No matter what happens to Dijsselbloem the Eurogroup needs an overhaul". ^ "Pierre Moscovici: Finance commissioner should also run Eurogroup". POLITICO. 14 June 2017. Retrieved 3 November 2017. ^ "Macron is right — the eurozone needs a finance minister". Financial Times. ^ "Key points in Juncker's 2017 annual EU address". Reuters. 13 September 2017. Retrieved 3 November 2017. ^ a b Vucheva, Elitsa (15 April 2008)eurozone countries should speak with one voice, Juncker says, EU Observer. ^ "BBC News - Cyprus bailout: Deal reached in Eurogroup talks". BBC News. ^ "Dijsselbloem under fire after saying eurozone countries wasted money on 'alcohol and women'". www.ft.com. Retrieved 22 March 2017. ^ "Head of Eurogroup in 'drinks and women' row". Sky News. Retrieved 22 March 2017. ^ Editorial, Reuters. "Portugal PM demands Dijsselbloem step down over "xenophobic" remarks". Reuters UK. Retrieved 22 March 2017. ^ "Renzi calls on Eurogroup chief to quit over 'drinks and women' comment". www.ft.com. Retrieved 22 March 2017.